They chose to represent florally the works of Constantin Brancusi, the Romanian sculptor with an overwhelming contribution to the renewal of plastic vision and language in contemporary sculpture. From thought to deed it has been almost a year, during which the two artists have designed and built the design down to the smallest detail. They chose to represent the Gate of the Kiss and the Table of Silence. Easy to say, hard to do at first, especially because they wanted to respect to some extent also the meaning of the two artworks. THE GATE OF THE KISS is the Temple of Kiss, Love’s Arch of Triumph, where man finds his woman the life’s half, joined forever in union. 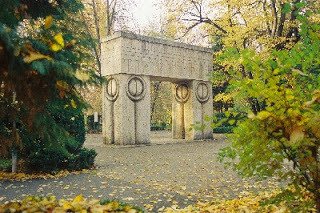 The Gate of the Kiss symbolizes the act of marriage of the Romanian soldier and the sacred communion between man and woman. The artist’s wisdom goes so far as, in this union of eyes, he sees everything merging: the whole universe, the earth – the moon – the woman and the sun – the sky – the man. 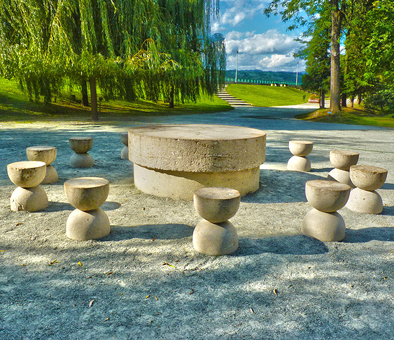 THE TABLE OF SILENCE, worked in limestone, is the table before the confrontation on the battlefield to which the Romanian soldier is to participate. It also means the spiritual life of the Romanian peasant, the 12 chairs clustered around the central table symbolizing the 12 apostles devoted to Christ. Hard to put in artwork the deep meanings of these two of Brancusi’s works, but it turned out, until the end, that all search, efforts, and hard work matched the final result. In a first stage the material for the works, mainly natural, authentic Romanian, was decided: willow twigs, moss, rosehip, after which the flowers were carefully chosen. The massive structure of braided willow twigs has not been chosen randomly. By composition, the two compositions highlight the sobriety and the symbolism in Brancusi’s works. To their achievement participated also artisans from Maramures, who fully showed their artistry. In another stage the plants and flowers to best represent the essence of Brancusi’s symbols have been chosen. Thus, the loving eyes, imagined as two hemispheres, on the The Gate of the Kiss were made of red rosehip. They exemplify love, the merging, through love, between man and woman, between heaven and earth, between the sun and the moon. The floral design designed and made for the Table of Silence expresses through colour, the flowers used and the natural moss green base, a table of silence before the battle. All expresses and flows in silence, with silhouettes of slender flowers raised and with a few large flowers at the base, to create a perfect balance. Time is also present, as represented by the circular arrangement of the 12 hourglass-like seats, which measure it. Discrete, with no flowers, just wattle and muscle, the seats fill the entire assembly in an almost perfect communion. 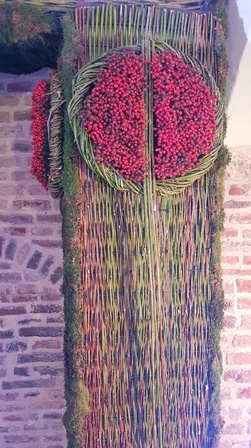 The female creators of this Romanian design put into practice all the techniques and knowledge acquired during the years of study in the floral field. 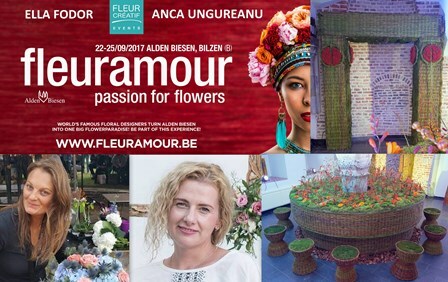 ANCA UNGUREANU, international master florist, has been present since 2015 at Fleuramour by supporting her own floral art demonstration during the event. It was a beautiful experience, so that in 2016 she was chosen, along with other eight florists, out of 200 candidates to have her own floral design in the space for the European Master Certification at Fleuramour. 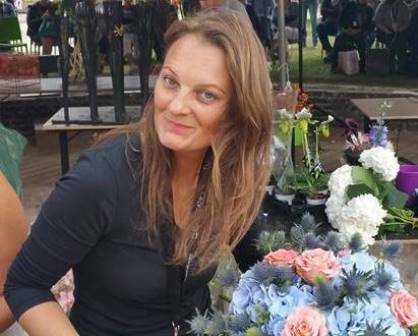 The Belgian experience helped her in the process of improving and bonding with the other florists, through direct involvement in designing the parts for floral top designers, world renowned, such as Tomas De Bruyne. Anca’s specialization in floral field began with the Floral Decoration And Trainer Diploma, certified by the Ministry of National Education. 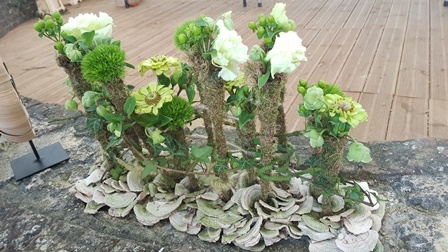 The improvement continued with the “Professional Dutch Floral Design”, completed in 2014 and the “Advanced Dutch Flower Design Course”, graduated in 2015 at Boerma Institute in the Netherlands, one of the most prestigious schools of floral design in Europe. 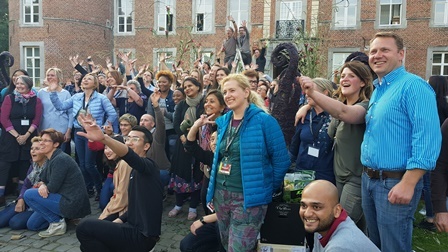 The education process continued by attending and graduating in 2016 of the European Master Certification Program (EMC – Belgium), following which Anca won the title of international master florist. “Three Days Master Creations with Wally Klett” – Certified by Boerma Instituut International Floral Design School in Holland. “One Day Seasonal Arrangement Course” – Certified by the Boerma Instituut International Floral Design School in Holland. November 2016 – ” Winter Moments with flowers “(Brugge, Belgium). Together with Tomas De Bruyne and his team, they have put in work the design for the centerpiece of the exhibition. Also, Anca has sustained a demonstration for the audience at the event. 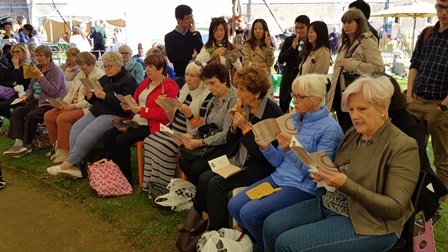 May 2017 “Hortiflore Expo IPM Shanghai” (19th edition) – the largest exhibition of floriculture and horticulture in Asia, where she made stand-ins floral design for various participants. Also during this period, she taught courses for a chain of flower shops in Shanghai. June 2017 – The 4th International Congress for Floriculturists and Trends 2017 (Frankfurt, Germany). Together with other 26 designers, they have showed trends in floral design for 2017, for Lehner Wholle, an Austrian producer of wool for decoration. 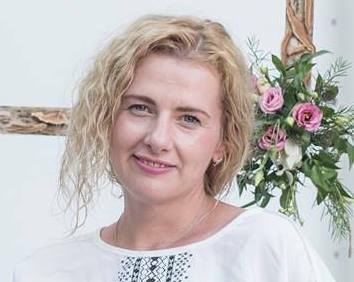 To assist those who want to embrace a career in floral art in Romania, Anca Ungureanu is lecturing the “floral decorations” course, certified by the Ministry of National Education at the Ioan I Dalles Popular University of Bucharest. She also puts into practice the knowledge and experience accumulated over 10 years in the private and corporate events, which she organizes through her own agency. 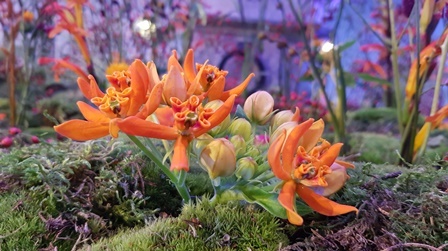 ELLA FODOR, international master florist, has been present at Fleuramour since 2015, by the support of her own floral art demonstrations during the event. 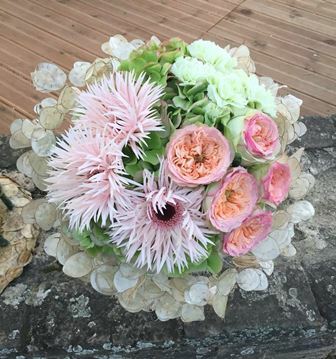 This Belgian experience helped her in the process of improving and bonding with the other florists, through direct involvement in making the designs for floral top designers, world renowned, such as Tomas De Bruyne. Since 2015 Ella has been a member of the Fleuramour exhibition organizing team, along Regine Montmans, the Fleuramour Art Director. Also, still in 2016, she returned to the Fleuramour stage with a successful demonstration. 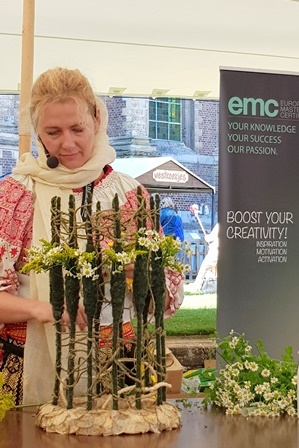 Among the major specialties of Ella in the floral field there is also attending and graduating in 2016 the European Master Certification Program (EMC – Belgium), following which she obtained the title of international master florist. She puts into practice every day the experience and knowledge acquired during study years by private and corporate successful events, she has been organizing for over 15 years. She has become consecrated by a style of design inspired by nature and Maramures, a place she considers “home”. November 2015 – ” Winter Moments with flowers “(Bruges, Belgium). She participated as an active member of the organizing team. Also, Ella had her own demonstration during the exhibition. April 2016 – “Floralien” (Ghent, Belgium). Together with Tomas De Bruyne and his team have put in work the design for the centerpiece of the exhibition. The design was voted and chosen the winner by the European public present and has also received the award for the best concept from the press during the event. November 2016 – ” Winter Moments with flowers “(Bruges Belgium). 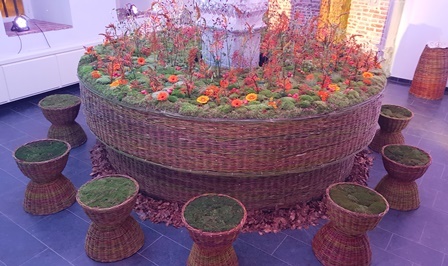 She was part of Tomas De Bruyne team and made, again, the centerpiece floral design of the exhibition. Also, Ella sustained a demonstration for the audience at the event. 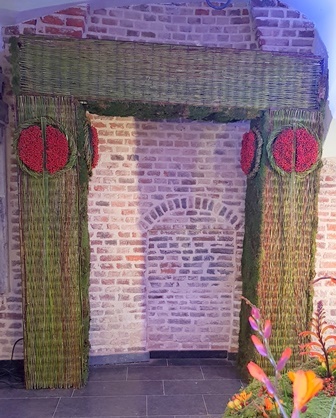 The two pieces of floral design, the Gate of the Kiss and the Table of Silence have been exhibited during the four days of the exhibition (22 to 25 September., a.c.) in the Leopold Willem salon of the Alden Biesen site, the former torture chamber. Alden Biesen Castle (Bilzen, Belgium) is an impressive edifice, built in the sixteenth century, in the province of Limburg, and has been hosting the festival for 22 years. FLEURAMOUR is the biggest European festival of floral designers worldwide. The “Flower parade” spread into the 35 rooms, and in the outer courtyard of the Alden Biesen edifice. 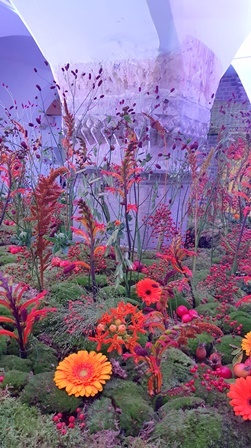 Each year, it enjoys the presence of over 100 florist designers and students from around the world. The exhibition is visited annually by over 15,000 visitors. Each year the heritage site Alden Biesen undergoes a floral metamorphosis, for this event being used more than 120,000 flowers. The Fleuramour experience is memorable for all who step into it: florist designers, students, volunteers, visitors. Moreover it is also a very useful experience, of charging with positive energy, and especially with new information, knowledge and innovative techniques for this industry. Apart from more than 100 exposed floral creations belonging to designers worldwide, workshops of all kinds were held during the event, from those for children to the ones sustained by world known florist designers, demonstrations of floral art prepared by consecrated florists, live are made for Belgian radio and television, there are shops where flowers, plants and other materials used in industry are traded. 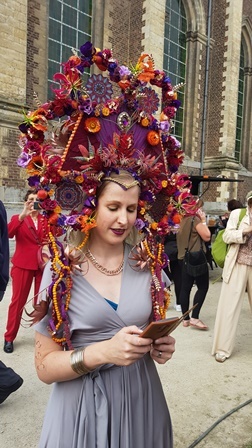 Of all the activities hosted, the most spectacular is the hat’s parade (Hat’s day) which takes place every year on the first day of the festival. 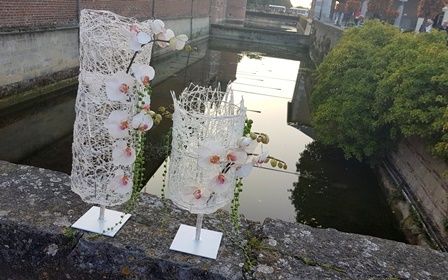 Besides the two works translated into floral designs, this year Anca Ungureanu held also a demonstration of floral art on the esplanade inside the castle at the European Master Certification, a graduated floristic study program. She has modelled the floral creations in a personal vision and recreated Romanian stories for the European public. And for the painting to be authentic, she wore an over 100 years old Romanian costume, enshrined in his family heritage. 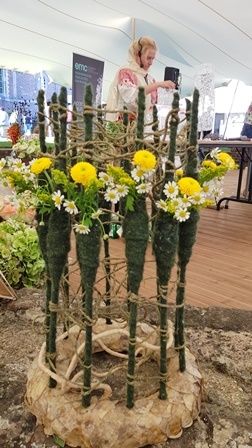 The Romanian spindle, as part of the Romanian tradition, has been turned into a flower story, which has enjoyed a large audience, enchanting the European public present. Also, the primeval forests found the appropriate floral representation during this demonstration. Participation in Fleuramour 2017 meant for Anca Ungureanu and Ella Fodor an important aspect in their careers, as well as bringing again the Romanian values into the European forefron.